The beauty of Georgi Gladyshev’s Liesegang Cosmology is that a small nodule of agate [which contains a central cavity i.e. a geode] is a natural As Above – So Below analogue for a silica planet. 1) “Basalt is one of the most common rock types in the world” and agate is “classically associated with volcanic rocks”. Agate is a cryptocrystalline variety of silica, chiefly chalcedony, characterised by its fineness of grain and brightness of color. Although agates may be found in various kinds of rock, they are classically associated with volcanic rocks and can be common in certain metamorphic rocks. By definition, basalt is an aphanitic igneous rock with less than 20% quartz and less than 10% feldspathoid by volume, and where at least 65% of the feldspar is in the form of plagioclase. Basalt features a glassy matrix interspersed with minerals. Basalt is one of the most common rock types in the world. Basalt is the rock most typical of large igneous provinces. The largest occurrences of basalt are in the ocean floor that is almost completely made up by basalt. Above sea level basalt is common in hotspot islands and around volcanic arcs, specially those on thin crust. However, the largest volumes of basalt on land correspond to continental flood basalts. Continental flood basalts are known to exist in the Deccan Traps in India, the Chilcotin Group in British Columbia, Canada, the Paraná Traps in Brazil, the Siberian Traps in Russia, the Karoo flood basalt province in South Africa, the Columbia River Plateau of Washington and Oregon. Many archipelagoes and island nations have an overwhelming majority of its exposed bedrock made up by basalt due to being above hotspots, for example, Iceland and Hawaii. Ancient Precambrian basalts are usually only found in fold and thrust belts, and are often heavily metamorphosed. The Catalogue of the Active Volcanoes of the World, published by the International Association of Volcanology, uses this definition, by which there are more than 500 active volcanoes. A large igneous province (LIP) is an extremely large accumulation of igneous rocks, including liquid rock (intrusive) or volcanic rock formations (extrusive), when hot magma extrudes from inside the Earth and flows out. 2) Silica is one of the “most abundant families of materials” on Earth and a nodule of agate is “a cryptocrystalline variety of silica” enveloped by a crust. Silicon dioxide, also known as silica (from the Latin silex), is a chemical compound that is an oxide of silicon with the chemical formula SiO2. It has been known since ancient times. Silica is most commonly found in nature as quartz, as well as in various living organisms. In many parts of the world, silica is the major constituent of sand. Silica is one of the most complex and most abundant families of materials, existing both as several minerals and being produced synthetically. Notable examples include fused quartz, crystal, fumed silica, silica gel, and aerogels. Measured by mass, silicon makes up 27.7% of the Earth’s crust and is the second most abundant element in the crust, with only oxygen having a greater abundance. Silicon is usually found in the form of complex silicate minerals, and less often as silicon dioxide (silica, a major component of common sand). Pure silicon crystals are very rarely found in nature. The Agate Analogue implies the Earth has a central cavity [or void] that will act as a resonance chamber that will amplify and sustain wave energy. A resonance chamber uses resonance to amplify sound. The chamber has interior surfaces which reflect an acoustic wave. When a wave enters the chamber, it bounces back and forth within the chamber with low loss (See standing wave). As more wave energy enters the chamber, it combines with and reinforces the standing wave, increasing its intensity. Since the resonance chamber is an enclosed space that has an opening where the sound wave enters and exits after bouncing off of the internal walls producing resonance, commonly acoustic resonance as in many musical instruments (see Sound board (music)), the material of the chamber, particularly that of the actual internal walls, its shape and the position of the opening, as well as the finish (porosity) of the internal walls are contributing factors for the final resulting sound produced. Therefore, the classical percussion method of “tapping on a surface to determine the underlying structure” can be used to determine whether the Earth contains a resonance chamber [cavity]. Percussion is a method of tapping on a surface to determine the underlying structure, and is used in clinical examinations to assess the condition of the thorax or abdomen. There are four types of percussion sounds: resonant, hyper-resonant, stony dull or dull. A dull sound indicates the presence of a solid mass under the surface. A more resonant sound indicates hollow, air-containing structures. As well as producing different notes which can be heard they also produce different sensations in the pleximeter finger. On Friday 11th March 2011 the Earth experienced a strong percussion “tap” off the coast of Japan which reverberated around the world. The 2011 earthquake off the Pacific coast of Tōhoku was a magnitude 9.0 (Mw) undersea megathrust earthquake off the coast of Japan that occurred at 14:46 JST (05:46 UTC) on Friday 11 March 2011, with the epicentre approximately 70 kilometres (43 mi) east of the Oshika Peninsula of Tōhoku and the hypocenter at an underwater depth of approximately 30 km (19 mi). The earthquake is also often referred to in Japan as the Great East Japan earthquake and also known as the 2011 Tohoku earthquake, and the 3.11 earthquake. It was the most powerful earthquake ever recorded to have hit Japan, and the fourth most powerful earthquake in the world since modern record-keeping began in 1900. The reverberations from Japan lasted for well over an hour at the University of Leicester. The three traces measure movement of the Earth’s surface in the vertical, north-south and east-west direction. It is difficult to argue that the 2011 Tohoku earthquake caused the Earth to ring like a bell because the beginning of the seismic signal received in Leicester does not display a smooth, well defined amplification peak nor a well sustained ring that slowly dissipates. However, when compared to a lunar seismic signal its possible to argue that the Earth was attempting to ring like a bell following the 2011 Tohoku earthquake and only partly succeeded because the seismic signal was partially damped out by surface and subterranean water. Saline water covers approximately 72% of the planet’s surface (~3.6×108 km2) and is customarily divided into several principal oceans and smaller seas, with the ocean covering approximately 71% of Earth’s surface. The damping effect was first detected in 2014 when it was observed that seismic waves are “slowed down” as they travel through “soggy rock” whilst the Earth rings “like a bell for days”. A reservoir of water three times the volume of all the oceans has been discovered deep beneath the Earth’s surface. The finding could help explain where Earth’s seas came from. The water is hidden inside a blue rock called ringwoodite that lies 700 kilometres underground in the mantle, the layer of hot rock between Earth’s surface and its core. The huge size of the reservoir throws new light on the origin of Earth’s water. Some geologists think water arrived in comets as they struck the planet, but the new discovery supports an alternative idea that the oceans gradually oozed out of the interior of the early Earth. “It’s good evidence the Earth’s water came from within,” says Steven Jacobsen of Northwestern University in Evanston, Illinois. The hidden water could also act as a buffer for the oceans on the surface, explaining why they have stayed the same size for millions of years. Jacobsen’s team used 2000 seismometers to study the seismic waves generated by more than 500 earthquakes. These waves move throughout Earth’s interior, including the core, and can be detected at the surface. “They make the Earth ring like a bell for days afterwards,” says Jacobsen. By measuring the speed of the waves at different depths, the team could figure out which types of rocks the waves were passing through. The water layer revealed itself because the waves slowed down, as it takes them longer to get through soggy rock than dry rock. Ringwoodite is a high-pressure phase of Mg2SiO4 formed at high temperatures and pressures of the Earth’s mantle between 525 and 660 km depth. It is polymorphous with the olivine phase forsterite (a magnesium iron silicate). 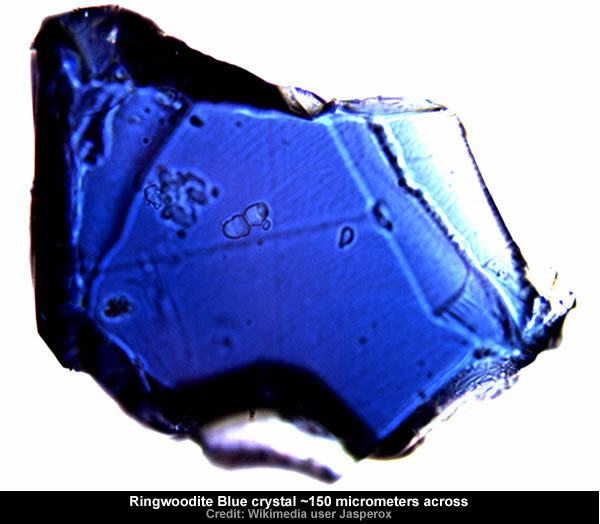 Ringwoodite is notable for being able to contain hydroxide ions (oxygen and hydrogen atoms bound together) within its structure. Combined with evidence of its occurrence deep in the Earth’s mantle, this suggests that there is from one to three times the world ocean’s equivalent of water in the mantle transition zone from 410 to 660 km deep. The amplification potential of the Earth’s central cavity [aka resonance chamber] can be observed by tracking seismic waves as they travel across the dry land of Virginia. By overlaying the three seismic signals it becomes apparent that [in this example] both the primary and secondary waves are amplified as they move further away from the epicentre [i.e. inland towards the Blue Ridge Mountains]. Thankfully, there are many other locations where the seismic signal dissipates [with distance from the epicentre] as it encounters surface water, subterranean water, “soggy rock” and any other damping influences. Gallery | This entry was posted in As Above So Below, Astrophysics, Earth, Geology, Liesegang Cavities, Science, Solar System. Bookmark the permalink.